"Universal Mother Bag" - stylish, practical and big enough! It is not just another bag of diapers and other baby accessories! With her Mom can meet all challenges of the day - to have everything you need for baby, but also be stylish and modern! The bag has a long shoulder strap and handles that can be used at two different heights or can be stowed in the bag. Distribution: 2 large internal compartments, 3 internal pockets with zip, 1 outer insulated pocket, 3 pockets without flaps. 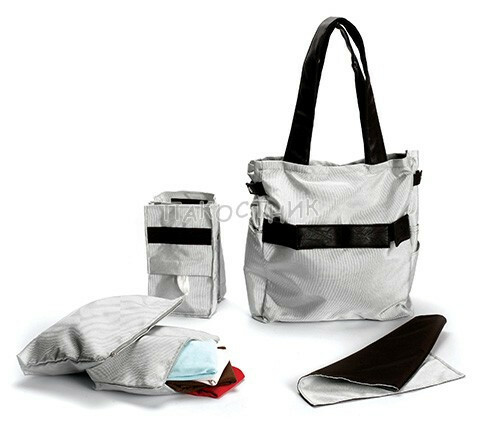 In the bag is impregnated pad changing mat (35 x 50 cm) with two persons and 2 pieces of zipper bags (20 x 25 cm and 25 x 30 cm). - To hand-wash only with cold water.